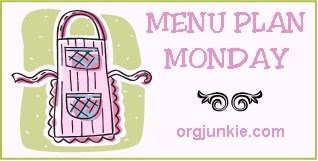 Click the pic to check out all the yummy menu plans over at Organizing Junkie. This week I'm trying some new and some family favorites. Monday: Extreme Low Fat Sweet-And-Sour Skillet Chicken for some reason I've been craving sweet & sour chicken. I found this recipe and it sounded so much healthier than the fried chicken version I had in mind, so I decided to give it a try. Wednesday: Cheese Enchiladas W/Sour Cream Sauce I am on a mission to make enchiladas that are as good as or better than those served at our favorite Mexican restaurant. I may be doing a lot of experimenting in the next few weeks. I think I'll make Spanish rice and refried beans as sides. Thursday: Blender Quiche This will most likely be made with Swiss cheese, some bacon, shredded smoked chicken, onions, jalapenos, and spinach. I love this recipe! It is so versatile and that makes it an old stand by in my kitchen. Friday: Bandito Chili Dogs Another family favorite! Saturday: Crock Pot Honey-Mustard Pot Roast This is a new one. If you've been following my meal plan, you have probably guessed that my freezer has been pretty well stocked with roast for awhile now. I am actually getting quite tired of pot roast, so this sounded different and yummy. Wonderful menu plan! Thanks for the recipes too. Have a great week. I think I'm coming to your house. Mmmm...yummy! I love pot roast! I WISH my freezer was full of it, but sadly, it's too expensive around here. My husband loves anything with mustard, so I'm going to try that recipe. Thanks! I would love to know how you do your Spanish rice, I hae neer had much success with making mine taste like what I get from a Mexican Restaurant. 79 cents a pound for pot roast! You're so lucky! The cheapest we can ever get it around here is $1.99 a pound.